Master the cooking with Leisure! The CK90C230C Cookmaster electric range oven not only looks great with its traditional design, it’s packed full of modern features too. 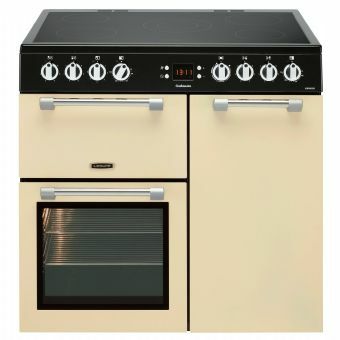 The 58 litre main fan oven boasts faster cooking at lower temperatures to save you energy and the 66 litre tall oven is great if you need that extra capacity. It has a dedicated grill cavity with grill pan, great if you’re looking for a healthy alternative to frying. Up top there’s a 5 zone ceramic hob with central dual zone for amazing results, plus it’s really easy to wipe clean. Speaking of which, the main cavity has catalytic liners on its sides to make cleaning the oven that bit easier.